What does it sound like when innovation and tradition collide? We carry the living lore of authentic American music into the present. Here you’ll find inspired explorations of America’s musical roots, with new interpretations of blues, jazz, soul, and Americana by established and emerging artists. Upright piano, lowdown "Bass VI" guitar, booming drums and Cool School vocals get into a blues-punk brawl at the studio of Black Keys producer Mark Neill. 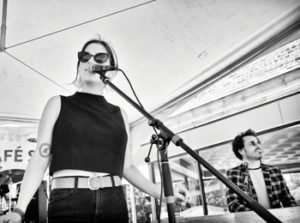 On their head-spinning new album, the Claudettes summon early blues, '60s pop-soul and Cramps-style psychobilly with a set of songs searching for the humanity hidden behind the vitriol, isolation and communication breakdown of the Internet Age. A tour-de-force exposition of the thrills of earthly vices, as only the Spankers can present them.